Case study: How to build good relationships with the Tenant & Realtor. Automatic Renewal? apartments are typical of most Singapore condos. Units ending #.......-28 faces pool. #....-30 faces River Valley Road. 4-bedroom. 2-levels, with kitchen immediately seen on one side on entering main door. Great location. Less than 5-min drive to the International Singapore School and the Overseas Family School, the Great World City Shopping Centre. Near Centre of action at Orchard Road. 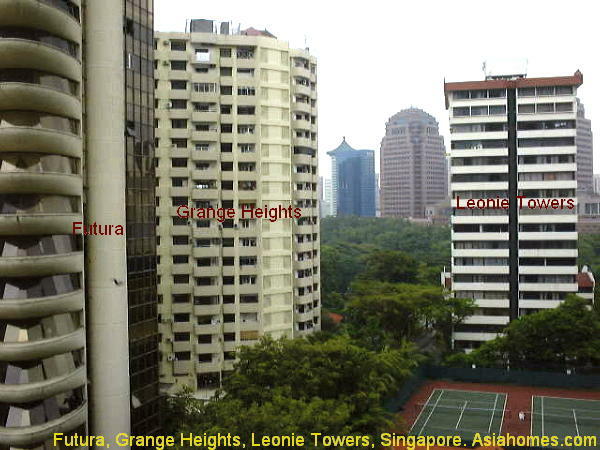 Grange Heights (middle) to the left of Leonie Towers (right) and Futura (left). 1. Leonie Gardens, the pink building (click thumbnail on left column) is very popular with Caucasian families and a very strong competitor to Leonie Towers. Both are a 8-12 minute walk to the Orchard subway and shopping. Interiors: Living/dining - greyish white marble; bedrooms - carpet or parquet, depending on Owner's remodelling. Built-in wardrobes, kitchen cabinet, big balcony, central air conditioning. Facilities: Big pool, car park, 24-hour security, tennis court, badminton court, no gym, playground, BBQ. Occupancy Rate: Above 90% being close to 2 subways and Orchard Road. Competitors: Leonie Gardens and other newer condos like Burlington Square Residence's penthouses which rent around $7,000. Floor plans of 1, 2, 3 bedroom condos of Burlington Square Residences (see below). Newcomer expat: Please contact Asia USA judy@asiahomes.com to help you get the best deal. Investors to note: Freehold. However, being over 20 years old, there is a need for upgrading the pool and surrounding. If you click thumbnail, you will see the competitors of Leonie Towers. 2. Grangeford, a brown building on the extreme left, (click thumbnail on left column) is also extremely popular, being a 5-minute walk to Orchard subway and the Takashimaya Shopping Centre. Location 10-minute walk to Orchard Road and 2 subways (Orchard & Somerset) and many shopping malls and supermarkets in Orchard Road and Great World City. SPACIOUS living areas and Orchard Road vicinity are great attractions. Sliding door in one bedroom near living/dining area is not actually a bedroom in the Caucasian mind. 4 bedrooms have attached bathrooms. Outside the CBD (Central Business District) Restricted Zone's toll gate and therefore no need to pay tolls per entry into the CBD. Away from traffic noise for most units and construction yet inside downtown. City living with little unobstructed views, being surrounded by high rises. Old development in need of upgrading, especially the swimming pool. Space and Orchard Road attractions. with Tenant & the Realtor. "I want you to hand over the keys, the cards, the manuals now" said the Lawyer-Landlord on receipt of the 2 months' security deposit and the one month's advance payment of rental. The tenancy commences 6 weeks later but he believed in the building of excellent Landlord-Tenant relationship. It does not bother him that the Tenant will occupy the Costa Rhu Condo rent-free for 6 weeks. However, the British Tenant has his house in Siglap, the tenancy of which would only expire on November 15, 1998 and will not need his condo for the time being. At the same time, he signed a cheque of $6,000 to Asia USA associate without waiting for the lease agreement to be stamped, the inventory list to be signed by the Tenant during take-over, the invoice, the letter of undertaking and all sorts of delays of most Landlords in Singapore. In this declining rental market (article written in Oct 1998. In Sep 2000, there is an increase in rent in downtown condos, but there are many more new condos completed since 1998, it is best to build up good will and retain the Tenant in the event of renewal. Of course, don't neglect the Realtor who is the one who had brought you the Tenant. Realtors don't get fixed salaries and are dependent on the performance in securing a Tenant for you. Once you have the Tenant, pay up fast and you can be sure that your condo or house will receive top priority in the event that you need a new Tenant. At the very least, you will not be forgotten. Prompt payment always get prompt attention and priority. Nobody wants to respond to you if you try to delay payment for services rendered, especially in this declining rental market. Intelligent marketing by the Landlord does not end in securing the Tenant. It goes further to build excellent relationship with the Tenant and the Realtor. There is always the risk that the Realtor may entice the Tenant away from your unit on expiry of the lease and if you have had treated the Realtor more than decently by paying promptly so that he/she can get bread on the table, you can be sure that you will be first on the list of all rental Realtors in Singapore, working hard to recommend their clientele to you first. Sep 23, 2000 Update: Automatic renewal of lease? The Tenant wanted to renew the lease for another 2 years commencing from October 2000, but the rent of waterfront 4+1 Costa Rhu has gone up and some units have rented at $8,000. The Asia USA Realtor advised the Landlord to take the $7,000 rent rather than hope to get a higher rental by kicking out the Tenant. The unit may be vacant for 2 months and he may lose out in revenue and it is hard to show the apartment when you want to kick out the Tenant. The Tenant may not co-operate no matter what you think, has been agreed upon in the tenancy agreement to permit viewing at "time to be mutually agreed upon" at the last month of tenancy . In any case, the Landlord renews the lease for one year and he was getting free advice as he had built up an excellent relationship with the rental realtor. queries from expatriates doing research on Singapore condos. Burlington Square Residence, 175 Bencoolen Street, is a new condo above retail shops, completed in 1999. It has full condo facilities and is a 10-minute walk to the Bugis or Dhoby Ghaut subway which is near Orchard Road. It is very popular with single Caucasian expatriates and couples without children because it is near food and beverage joints. You can walk to Suntec City or Raffles Place in about 15 to 25 minutes. There are many taxis and buses. The few units with a large terrace are snapped up fast. Email judy@asiahomes.com or tel: +65 9668 6468 for updates. The floor plans of 1, 2 and 3 bedrooms are representative of most Singapore condos. An attached bathroom for the master bedroom and a common bathroom shared by 2 bedrooms. Some condos may have an additional attached bathroom in the 3rd bedroom (as in Holland Peak) or 4th bedroom (as in Costa Rhu), but these are exceptions. The powder room (some have shower stalls) may be a separate bathroom near the living area or is the common bathroom. CLICK thumbnail to see bigger floor plan. 1 & 3-BEDROOM APARTMENT floor plan. Marble flooring in the living area and parquet in the bedrooms. On the fifth floor, there is the big lap pool is beautiful with a large waterfall in the middle of the length of the pool, landscaped garden, 2 big jacuzzis, tennis court and big gym attract many expatriates. There is no gardens compared to the conventional condos. 3-bedroom unit, 1016 square feet, rents around $4,000 fully furnished. There are 1- and 2- bedroom apartments for rent around $3,500. The 4-bedroom penthouse rents from $8,000. Burlington Square Residence for rent research report.